If you're planning to travel to Mexico, you may be concerned with how you will access your funds to pay for expenses during your trip. You should be aware that credit and debit cards are not accepted in all establishments in Mexico, and when paying for small expenses on the go such as taxis, bottled water, admission fees for museums and archaeological sites, as well as when eating at local restaurants or food stands, you will need to pay in cash, and that means pesos, not dollars. So before your trip, you should consider how you will get those pesos. An easy way to access money while traveling is to use your debit or credit card in an ATM or cash machine in Mexico: you will receive Mexican currency and your bank will withdraw the equivalent funds from your account plus a fee for the transaction. However, you may also wish to bring a certain amount of cash with you to exchange during your trip, and the following is a primer on what you need to know about exchanging money in Mexico. 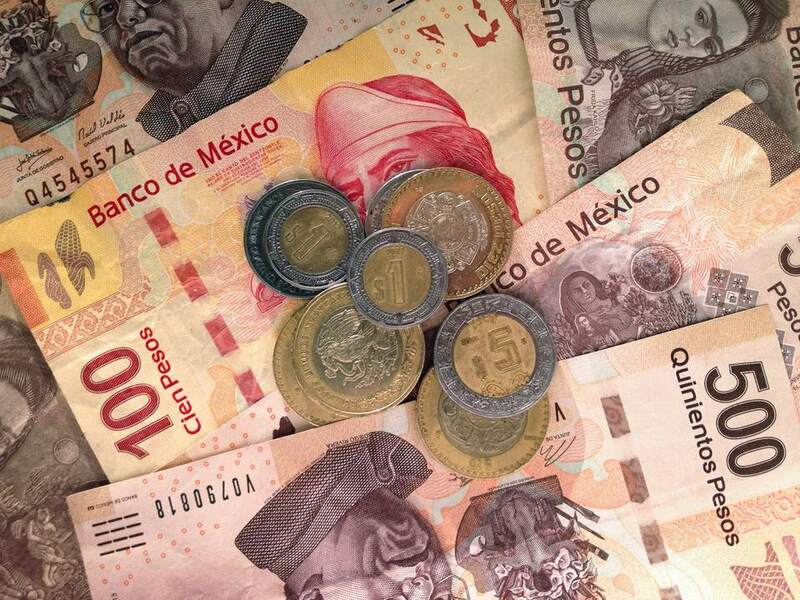 The currency in Mexico is the Mexican peso, sometimes referred to as the "Nuevo Peso," since its introduction on January 1, 1993, after the currency was devalued. The "dollar sign" $ is used to designate pesos, which can be confusing to tourists who may be unsure whether prices are quoted in dollars or pesos (this symbol was actually used in Mexico to designate pesos before it was used in the United States). The code for the Mexican peso is MXN. See photos of Mexican money: Mexican bills in circulation. The exchange rate of the Mexican peso to the US dollar has varied from 10 to around 20 pesos within the last decade, and can be expected to continue to vary over time. To find out the present exchange rate, you can go to X-Rates.com to see the exchange rate of the Mexican peso to various other currencies. When exchanging U.S. dollars to pesos at banks and exchange booths in Mexico, you should be aware that there is a cap on the amount of dollars that can be changed per day and per month for each individual. This law was put into effect in 2010 to help combat money laundering. You will need to bring your passport with you when you change money so that the government can keep track of how much money you change so that you don't go over the limit. Read more about the currency exchange regulations. It's a good idea to get some Mexican pesos before your arrival in Mexico, if possible (your bank, travel agency or exchange bureau should be able to arrange this for you). Although you won't receive the best rate of exchange, it may save you worries upon your arrival. You can change money in banks, but it is often more convenient to change currency in a casa de cambio (exchange bureau). These businesses are open longer hours than banks, usually do not have long line-ups as banks often do, and they offer comparable exchange rates (though banks may offer a slightly better rate). Check around to see where you will receive the best exchange rate (the exchange rate is usually posted prominently outside the bank or casa de cambio. Most cities and towns in Mexico have an abundance of ATMs (cash machines), where you can withdraw Mexican pesos directly from your credit card or debit card. This is often the most convenient way of accessing money while traveling - it's safer than carrying cash and the exchange rate offered is usually very competitive. If you're going to be traveling in rural areas or staying in remote villages, be sure to take enough cash with you, as ATMs may be scarce.